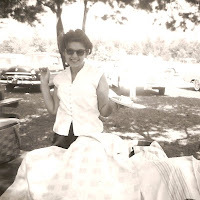 My faithful readers (if I have any left with my recent decline in posts) will recall that I've had several posts on either this blog or my other genealogy blog, The Oracle of OMcHodoy, that describe my Aunt Marianne. I have also mentioned that I've had a few aunts with disabilities, including another with Down syndrome, Anna DOYLE (1909-?). My mother's father, James O'ROURKE (1902-1963) also had a sister named Lucille, who is rumored to have had some type of mental illness. Many people hide their "different" ancestors. I cherish them, and in some odd way, credit them with my profession as a social worker in a clinic for children with medical diagnoses that often result in a disability (such as cerebral palsy, spina bifida, and a whole lot of other illnesses and disorders). Today I found a blog that looks to be hosted by Temple University in Philadelphia. I found it after reading a comment by Penny, who featured my very own Marianne McHUGH. I'm so glad she posted a comment on my COG post on women. Sure it's nice to know that someone appreciated the post and the pictures, as others have said they did as well. But I'm glad also that I found a new resource that may prove helpful in my life as I strive for a better understanding of people with disabilities and in my career as a medical social worker. Check out the blog at Temple University Disability Studies program. You might learn something and be enriched by the experience. the U.S. with the first name of Colleen. 18,217 people in the U.S. share my last name. There are 8 people in the U.S. that share my full name. "I'm teaching a beginner genealogy class, and I'd like to help people avoid the mistakes we made when we started out. I have my own list, but I'd like to get an unscientific poll from this prestigious group of the three things you regret the most, when you started (i.e. not citing sources, etc.)." I'm afraid my regrets will be much the same as others' were. First, I regret that my grandparents had all died before I'd completed my childhood. I know, I couldn't have prevented this, but I still regret that my maternal grandfather, James O'ROURKE (1902-1963) died the year before I was born. My paternal grandparents, Mary (HODICK) McHUGH (b. 1906) and Joseph McHUGH (b. 1902) both died when I was 12 years old (Mary on Valentines Day in 1976 and Joseph in Sept. of 1976). While we visited them often, I was at a developmental stage where their growing up years just didn't interest me. In the late summer of 1977, my family had moved from Niagara Falls, NY to Tempe, Az when I was 13. My maternal grandmother, Regina (aka Jean) died 2 years later. Again, though I was closest to her and wrote her often after we moved, I never thought to ask about her own history. As a result of my grandparents' deaths when I was still a more-or-less self-centered child, I don't have a single recollection of stories from them about their families and hometowns. And this, I now feel, is very, very sad. At least I have memories of them, which offers some comfort. And I do have many photographs, especially of Grandma Hodick-McHugh. While no regret will top the lack of stories I have about my ancestors, I, as many other genealogists as well, regret my lackadaisical methods of citing my sources. For my speculations that I included in the "notes" section of my genealogy database, I think I did a pretty good job of citing the sources that led me to those speculations. But I know I need to go back and review a whole lot of the information to re-discover the sources. Lastly, to keep with the question of "three" regrets, I'd have to say that I regret that I take a long time to make good on my promises to cousins to send updated information and pictures. I won't make excuses. I'm just horrible at getting things out in the mail. You might have noticed that I did not post a picture of Gramma (DOYLE) O'ROURKE. That's because I was saving hers for the end. I think I posted this picture once before a long time ago. 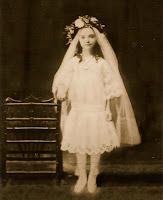 It's a picture of my grandmother DOYLE on either her first communion day or her confirmation day. I'm guessing she was about 8 years old, which would date the picture around 1913. The original photograph is oval shaped (though not a bubble picture, like the original of my paternal grandparents' wedding in 1925) and is in very poor condition. So poor I advised my niece who now has possession of it to never take it out of the frame again, as it is crumbling on the edges (it was mounted on cardboard of some sort). Anyway, a friend of mine managed to get a decent digital photograph of the picture which I took to a local photography shop. They were able to change the background. I intend to bring it back someday and ask them to put a bit lighter-shaded background on since she looks rather ghostly in this one (I think the digital version wound up making a double image, as they told me it had one). However, it is still among my most treasured possessions, which I thought I'd never have since we kids would have wound up in arms over who gets it had the decision been left to us. Thank God for technology. Here it is, Regina (Jean) DOYLE ca 1913. The 44th edition of the Carnival of Genealogy is all about women! Since March is Nat'l Women's History Month, we are to pick one woman in our history, family, friend, historical figure, and spotlight her for our blog. There were so many women in my family history to choose from, but really there was no question as to whom I'd pick. My paternal grandparents' oldest surviving child was Marianne McHUGH. She was born 29 Nov 1930 with Down Syndrome. They were basically told to lock her away in some institution, that she'd never be able to function. My grandparents would have none of it, took her home, and raised her almost as if nothing was wrong. She was part of the family and would be treated as such. The story has it that Marianne was given the baby doll she's holding in the first picture by a cousin when she was born . Marianne was followed by two non-disabled children, Noreen and Dennis (my father). She grew up alongside her siblings, and amidst her aunts, uncles and cousins. She was always part of the activity, not shunned and set aside. She was allowed to be silly and was not afraid to be herself. Marianne was favored by all who met her, say those who grew up with her. And everyone was favored by her. I knew Marianne as a child as my aunt -- my dad's sister. I do not remember playing with her, talking with her, getting to know her. I was a child, and she was my aunt, whom I knew was different. I always wished I'd known her better. But through stories I've heard about her from dad and cousins, I think I know her well enough now to know that she was one special lady. I often wonder what her life would have been like had she been born in my era, instead of her own. She would have gone to school, for one thing. Perhaps she would have joined Special Olympics. As it was, she did not partake in any community activities that I know of; I doubt anyone with Down Syndrome did in that time. But she was raised in a loving home, was given all the attention she ever wanted (and probably more) and she was adored by others as she adored Liberace. Yes, Liberace. Apparently the world in the McHugh household stopped dead in it's tracks if Liberace was on the radio or later, on t.v. And no one DARED to walk across the room by crossing between Marianne and the t.v. Marianne died on 28 April 1978 at the age of 47. Not a bad life span for a woman with Down Syndrome born in 1930. Word also has it that Marianne was buried with but one special item. I hope the word is true. Miriam at AnceStories 2: Stories of Me for my Descendants posted a new writing prompt. 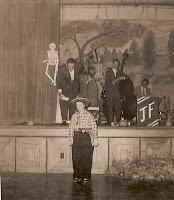 Laughter, the Best Medicine" is the topic for Week Thirty-three over at my journal prompts blog, AnceStories2: Stories of Me for My Descendants. Who in your family shares your laugh? Do you sound like one of your grandparents? What about a cousin, aunt, or uncle? Who giggles like you? I don't know about the sound of my laughter in comparison to my ancestors or relatives, but I can tell you one thing: The women in my life could laugh with the best of them over absolutely positively nothing! I can't tell you how many "slips of the tongue" peels of laughter occured amongst us women. You know what I mean: Someone says something but got the words mixed up, like saying "Grixed Meens" instead of "Mixed Greens". Very often after a slip of the tongue like that, we women would chuckle. FIVE minutes later, after the goof was long forgotten, two of us would look at each other and burst into fits of laughter. We're not talking giggling. We're talking "where's a chair I gotta sit down cuz I'm laughing too hard to stand up", laugh-til-we're-crying type laughing. Every woman in my family that I remember would have this phenomenon. When it'd start, the men would just leave the room with a "there they go again" statement on their way out. To this day I can't have a laugh like that and not feel close to the women of my childhood. Paternal grandmother, Mary HODICK, presumably before her marriage to Joseph McHUGH in 1925.
maternal grandmother, Regina (DOYLE) O'ROURKE. 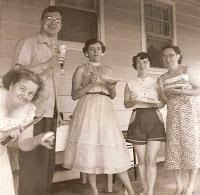 My mother Regina (Jean) O'ROURKE (on the left) in about 1946. My father's sister, Noreen McHUGH.